UAE has always welcomed expat population for business, employment and residence. It is the reason that several big cities in this Gulf country have a sizable expat population and it is continuously increasing. Dubai is an example where more than 85% of population is comprised of expats. Abu Dhabi and Sharjah are other important cities with large number of expat population. There are several factors involved in this huge influx of foreign population in the country. The government provides support for expats to reside here for long periods, the local population is quite friendly and accommodating, economic and political stability is thriving and best facilities available at relatively affordable rates are few important reasons behind large expat population in UAE. Now a recent survey tells that another factor has also come in place that will make the life further easier for expats in UAE. As we know that best facilities can’t be acquired without high payment. UAE provides world class services and at lower rates than several Western countries. 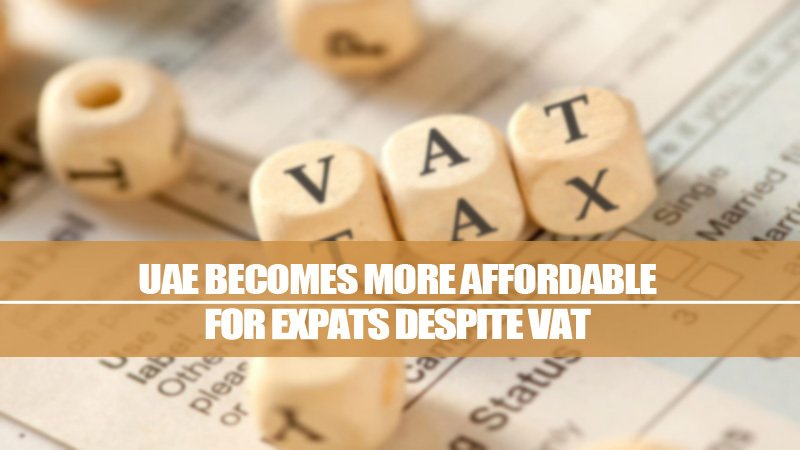 But now the expats in UAE can enjoy best facilities for even cheaper rates than before due to decrease in cost of living. It is mainly due to lower oil prices, fall in rents (of residential and commercial buildings) and strong local currency. These factors are playing so important role that they have even minimize the impact of VAT (value added tax) on the lives of people. It is according to a report by Mercer’s annual cost of living survey. It shows that both Dubai and Abu Dhabi are now not among the world’s 25 most expensive cities. Dubai was at 19th place last year in this list which has now been placed at 26th spot. Abu Dhabi has seen even more fall as the city has come down from 22nd position last year to 40th this year. The ranking is based on 209 cities in different parts of world. According to experts, decrease in rents is the most important factor for decrease in cost of living. Reduction in commercial rents results in decrease in prices of various products as retailers pass their benefits to consumers. It is a known scenario in competitive markets. In the last three months, the rents have either come down or remained stable. Strengthening of dirham has its role in creating the said effect. It reduced the cost of imported foods which is directly liked to cost of living in UAE that imports most of commonly used products. Low oil prices and several measures by government (especially reducing fees of various sectors) are also important factors in this regard. All these reports and facts are clearly indicating that UAE is becoming more attractive place for expats to live and do business. If you want to take advantage of this situation, then you can contact Riz & Mona Consultancy for visa services in Dubai and other parts of UAE.